​1. On your next visit to Odds, approach our counter staff and simply register your mobile number as your ID and you will immediately get an SMS inviting you to update your profile thru a link sent by our partner Advocado. ​2. Upon completing the short registration will instantly get a free cup of Hot or Iced Coffee Drink. ​3. Make sure to check your points before you leave. ​1. For every Php100 spending from Cafe or Nail Spa, loyal customer gets 5 points which can be exchange to our Spa Gift Vouchers. ​2. 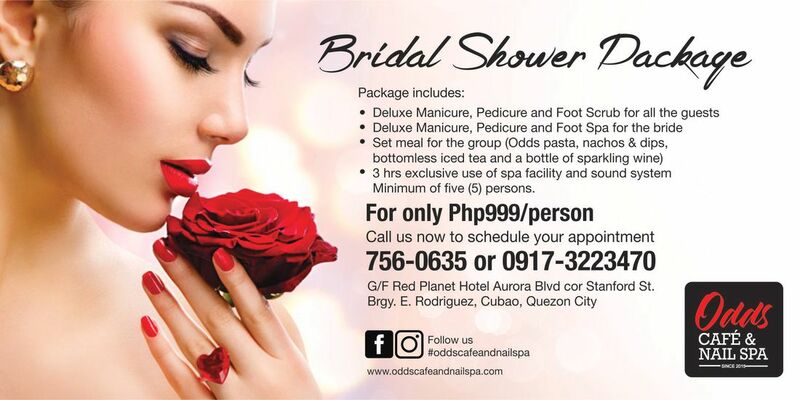 Exclusively entitled to our 10+1 Pamper Me promo where you will get your Pamper Me package for FREE when you complete our 10 stamps. Freebie is transferable. ​3. Exclusive access to daily voucher deals posted on FB and IG pages. Register now so we can start rewarding you. We also accept Visa and Mastercard payments.